The Trojans were out in full force today as the annual ‘spring game’ is set for this upcoming Saturday. While the offense is moving closer and closer to the final product, the defense yet again came out strong and physical, looking energized, eager, and ready to put on a show Saturday. The Trojans were in full pads today. Players out today included wide receiver Devon Williams and left tackle Austin Jackson. In Jackson’s place, Jalen McKenzie went at left tackle, while Liam Jimmons stepped in at right tackle. The run game saw tailback Stephen Carr gain good momentum on several big runs. Markese Stepp had a powerful run up the middle, and eventually found his way through the defense for several ten yard gains. Stepp could be a real problem for opposing defenders regularly and on third down this upcoming fall. Kedon Slovis had another excellent day, showcasing both his arm, speed, and his intelligence on the field. Slovis had several completions to Tyler Vaughns and Michael Pittman for short but effective gains. He escaped the pocket several times for significant run gains or appropriate throwaways, feeling the pocket pressure even in the endzone. Slovis might face an uphill battle up the depth chart, but he continues to impress. 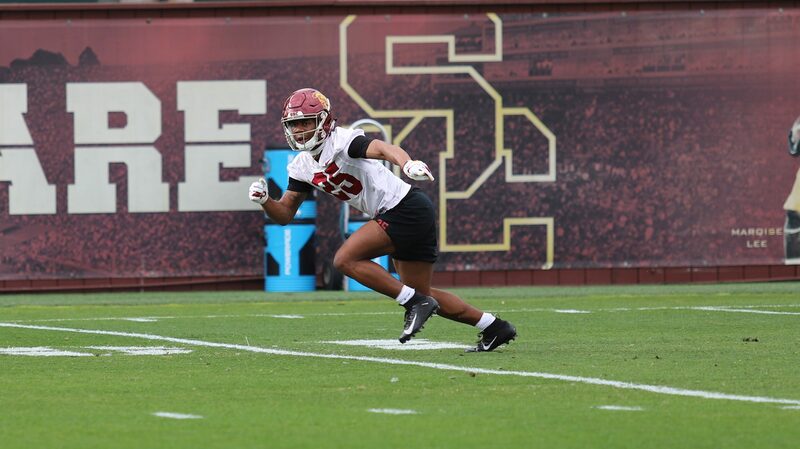 Jack Sears also had a good day at practice today, including a pass to Vavae Malepeai, who turned up the field for 30-something yards as he dipped left and cut right for a touchdown. JT Daniels looked effective in red zone action, as he led his team from the 30 down to the 5. While he connected on multiple short passes to Pittman and Amon-Ra St. Brown, the offense was stuffed multiple times as they attempted to run it up the middle from the two-yard line with both Carr and Malepeai. The drive finished with Daniels hitting Erik Krommenhoek for a touchdown. The defensive line looked extremely impressive and dominant today as they virtually ran openly through the offensive line. If they were allowed to hit the quarterbacks, several sacks would have been recorded on all of the QBs today. In fact, the defense won the day on a safety of Slovis by Jordan McMillan. The defense was fired up after this play despite no one actually getting hit. Slovis had a couple nice plays, gaining nine after escaping the pocket, as well as hitting Tyler Vaughns for a 20-yard completion. Stepp had a nice push through the nearly all defenders toward the endzone that put him down at the one-yard line. Quincy Jountti had a nice 30 yard gain up the middle of the field for a great touchdown. Jountti had another run for a 15-yard touchdown as well. Matt Fink hit Pittman with a nice ball for a 12-yard gain. Slovis threw the ball to receiver Mathew Hoccum who was blown up as soon as he caught the ball by Brad Aoki, firing up the defense.